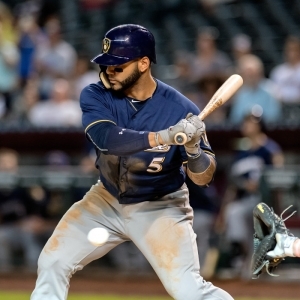 The Colorado Rockies visit Miller Park on Tuesday to play the Milwaukee Brewers. The probable starters are Jon Gray for the Rockies and Chase Anderson for the Brewers. The opening line for this matchup has Colorado at -135 and Milwaukee at +125. The over/under was set at 9. The Rockies have a 58-62-4 over/under record and a 69-55-0 run line mark, meaning they cover 56% of the time. The Brewers are 62-61-0 against the run line and have a 59-57-7 over/under record. They cover the spread 50% of the time. The Rockies head into this matchup with a 60-64 record, including 28-33 on the road. Starting pitcher Jon Gray has a 8-6 record with an earned run average of 4.69 and a WHIP of 1.25. He has 132 strikeouts over his 126.2 innings pitched and he has given up 115 hits so far this season. He has allowed 8.2 hits per 9 innings and he has a FIP of 3.83. The bullpen this year has an earned run average of 4.83 and they have given up 431 base hits on the year. Teams are hitting .267 against the bullpen while being struck out 359 times and walking 150 times this season. As a team, Colorado has allowed 9.62 hits per nine innings while striking out 7.42 batters per nine. They are 28th in the league in team earned run average at 4.91. The Rockies pitchers have collectively given up 1,170 base hits and 597 earned runs. They have allowed 132 home runs this season and they allow 1.1 homers per nine innings as a staff. Colorado as a pitching staff has walked 407 batters and struck out 903. They walk 3.3 men per 9 innings while striking out 7.4 per 9. They have a team WHIP of 1.44 and their FIP as a unit is 4.31. As a team, Colorado is batting .274, good for 2nd in the league while putting together a .245 average away from home. The Rockies hold a .458 team slugging percentage and an on-base percentage of .338 which is good for 3rd in baseball. They rank 2nd in baseball with 9.44 hits per game. Nolan Arenado comes into this game hitting .280 and his on-base percentage is at .351. He has 132 hits this season along with 90 runs scored and 104 runs batted in. He's struck out 70 times and has walked 54 times. Carlos Gonzalez is hitting .320 and he has an on-base percentage of .369. He has totaled 141 hits so far while scoring 74 runs and he's driven in 80. He has walked 35 times and has struck out 101 times. The Rockies have 1,172 hits, including 246 doubles and 158 home runs. They've stolen 52 bases while they've been thrown out stealing 32 times. Colorado has walked 398 times this season and they've struck out 1,007 times as a unit. They've left 833 men on base and have a team OPS of .797. They score 5.32 runs per contest and have scored a total of 660 runs so far this year. Milwaukee comes into this matchup with a 33-29 home record and a 53-70 overall mark. With an earned run average of 4.97, Chase Anderson has a 7-10 record and a 1.41 WHIP. He has 91 strikeouts over the 114 innings he's pitched during which he has given up 119 hits. He has allowed 9.4 hits per nine innings and his FIP stands at 5.27. So far this season the bullpen has an earned run average of 3.91 and they have given up 418 base hits on the year. Teams are hitting .257 against the Brewers bullpen while being struck out 384 times and walking 169 times this season. As a team, Milwaukee has allowed 9.32 hits per nine innings while striking out 7.35 batters per nine. They are 20th in the league in team earned run average at 4.38. The Brewers pitchers as a team have surrendered 1,125 base knocks and 529 earned runs so far this season. They have given up 142 home runs this year and they give up 1.2 home runs per nine innings as a staff. Milwaukee as a staff has walked 422 hitters and struck out 887. They give up a walk 3.5 times per 9 innings while they strike out 7.3 per 9. Their team WHIP is 1.42 while their FIP as a staff is 4.53. As a team, they are batting .247, good for 25th in the league while putting together a .253 average at home. The Brewers hold a .401 team slugging percentage and an on-base percentage of .327 which is good for 12th in baseball. They rank 28th in baseball with 8.12 hits per contest. Jonathan Villar comes into this matchup batting .299 and he has an OBP of .382. He has 135 hits this year along with 67 runs scored and 43 RBI. He's struck out 135 times and has walked on 62 occasions. Ryan Braun is hitting .318 and he has an OBP of .379. He has collected 123 hits so far while he's scored 62 runs and drove in 70. He has earned a walk 36 times and has punched out 70 times. The Brewers as a unit have 999 base hits, including 185 doubles and 138 homers. They have 137 stolen bases while they've been thrown out 43 times. Milwaukee as a team has walked 469 times this year and they have struck out 1,163 times. They've had 842 men left on base and have an OPS of .728. They score 4.1 runs per game and have totaled 504 runs so far this season.